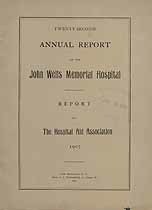 Twenty-Second Annual Report of the John Wells Memorial Hospital and Report of The Hospital Aid Association, 1907. New Brunswick, New Jersey. The Hospital was organized as the "New Brunswick City Hospital," March 13, 1884. The first annual report was for the fiscal year 1885 to March, 1886, and showed receipts amounting to $744.07. Nineteen patients were admitted and cared for during this year. Names in this online transcription include Baldwin, Benedict, Buttler, Carpender, Carroll, Clark, Cook, Cooke, Donohue, English, Gutmann, Horn, Johnson, Kobbe, Leupp, Miller, Murray, Owen, Peterson, Pownall, Prentiss, Riva, Roe, Smith, Stevens, Sutton, Suydam, Waldron, Wells, Willis. The Genealogy Today catalog number for this item is 16046. When inquiring about the information in this resource, please mention the catalog number.